Nitti is a monospaced typeface family in five weights plus italics that has its roots in the first sans-serif designs of the 19th century – the Grotesques. Originally a British invention, the Grotesques gained massive popularity in mainland Europe and also became widespread in early 20th century USA where it was commonly referred to as ‘Gothic’. The quirky and often idiosyncratic shapes of these designs lend them a humanity and warmth which is still appreciated among many graphic designers. Nitti is named after Francesco Raffaele Nitto, better known as Frank ‘The Enforcer’ Nitti, one of the henchmen of Al Capone. The typeface family is part of a bigger collection of Grotesque-inspired typefaces that also includes a poster version called ‘Stanley’ and a proportional version called ‘Nitti Grotesk’. Nitti comes in two versions. 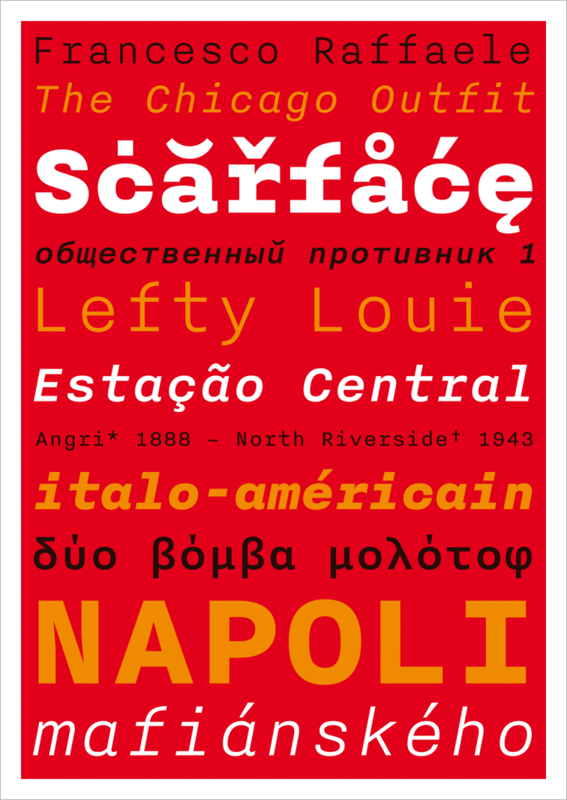 Nitti Basic offers 310 characters per font and only supports western European languages. The full version of Nitti on the other hand offers a generous 657 characters per font including many more accented letters, Greek and Cyrillic. This version covers all European languages together with most Asian languages that use the Cyrillic script.